Newbury Dental Group > Blog > Uncategorized > What is Cosmetic Dentistry? Cosmetic dentistry can help fix chips, discoloration, missing, broken or misaligned teeth. Although it is considered cosmetic and not medically required, many patients decide to get dental work done to improve their smile and appearance. Newbury Dental Group can work with you to create a treatment plan to improve your smile confidence with a variety of possible procedures. Teeth whitening is one of the most popular cosmetic dental procedures in the United States. Simple, inexpensive, and non-invasive, teeth whitening is an excellent cosmetic dentistry option for improving your smile. Bleaching your teeth in a professional dental office will assure your teeth are safely taken care of with even results. A veneer is a thin shell that is made out of porcelain, composite, or ceramic which is crafted to match the surrounding teeth. Veneers are used to reshape and repair teeth from chips, fractures, or discolorations. Many people use veneers to create a ‘hollywood smile’ because they can cover damaged teeth to completely transform your appearance. A dental crown is a cap that surrounds the tooth. 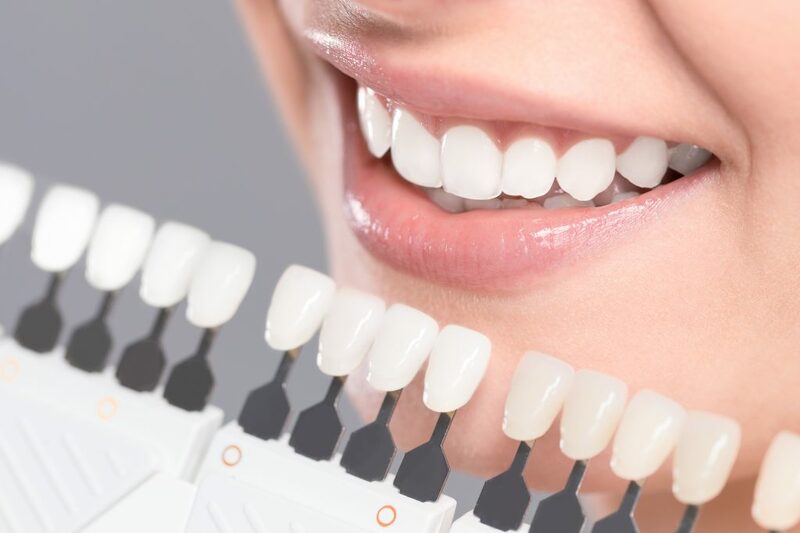 They are very effective for restoring teeth that have been infected or damaged, and help patients gain functionality without the appearance of having any dental work. Crowns can consist of all-metal, ceramic-on-metal, and all-ceramic, depending on the location in the mouth. Metal is used for durability, but ceramic has a natural appearance to match the surrounding teeth. The benefit of a crown is that it functions as a normal tooth, so you can eat and drink without discomfort, and speak normally. If you have one or more missing teeth, a dental implant could be a great solution for you. This procedure is very long-lasting and does not affect any of the surrounding teeth. The implant is surgically fastened to the jaw with a metal post, which means you don’t have to worry about your tooth coming loose or decaying. Implants look completely natural and help restore natural speech, eating, and drinking patterns. Although implants are extremely easy to care for, you will still need to brush and floss teeth as usual, with regular dental exams and cleanings. We are currently offering a promotion for an implant, abutment, and crown for $1995. Reach out to us at 805-410-1532 to set up an appointment with one of our dentists experienced in cosmetic dentistry. Newbury Dental Group provides a wide variety of dental services and procedures to address all of our patients’ dental health needs. By combining quality patient care with up-to-date technology, we are able to treat patients of all ages in a comfortable and relaxing setting.